However, this layer can be damaged and needs to be maintained appropriately. This layer can become damaged from abrasion from knives, cookware items and even packaging. 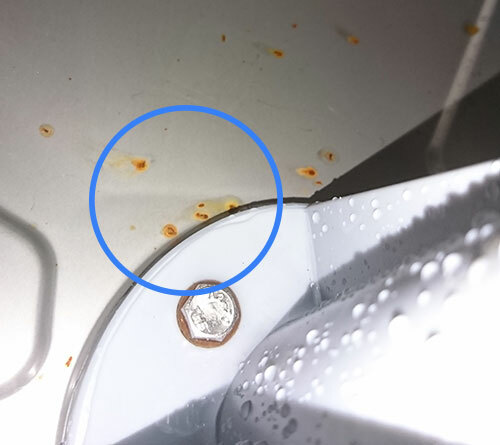 Also, a deposit of water and food can damage the protective coatings which can lead to localised corrosion known as "pitting" shown on the image to the left. Another thing that can cause damage is certain chlorides found in food and cleaning chemicals. The chlorine ions break down the layer causing pitting exposing the inner metal increasing the chance of rusted forming. It is therefore essential that you ensure the cleaning detergent chemical you are using is appropriate and that you use the correct dosing amount. If a reddish-brown spot regularly coat your dishwasher interior, iron in the water supply is the reason. In some areas in the UK, the local water naturally contains iron oxide , which is deposited in the machine during the wash cycle. Another source of iron in your water could be rust from old galvanized pipes in the plumbing. Using the correct dosage amount of Glasswash or Dishwasher detergent and a rinse aid helps prevent rust stains from iron. If the problem doesn’t go away, remove all the dishes and try citric acid crystals or a specialized dishwasher cleaning product for removing rust stains. A plumber can also fit rust filters or iron removal equipment to your water supply. Though the inner surface of your dishwasher isn’t likely to rust, the racks can suffer this problem after a few years of use. When the racks lose their finish, the metal underneath becomes exposed to water and turns rusty. Sometimes you can see the rust, or you might only see blisters on the finish. Beneath the blisters are patches of rust. One way to prevent this is to load your dishes the right way. Crockery should always be placed upside down so that water slips off the surface for complete drying. Metal items like cutlery and even pots and pans can turn rusty after washing in a dishwasher. Stainless steel knives, forks, and other cutlery develop rusty pits on their surfaces; especially silver cutlery, after prolonged exposure to hard water that's not treated or filtered as well as excessive chemical dosage. Furthermore, ensure you rinse off any cutlery prior to washing in your dishwasher, any acidic or salty foods can increase corrosion chances. Check that you’re putting the dishwasher through the correct cycle after adding salt, according to the manufacturer’s instructions. Pre-rinse cutlery to remove food substances prior to washing.